So, you have a great idea for a company and you want to be the next big thing in your industry. Although LinkedIn can’t guarantee that you’ll find the right funding partner, get the money you need, and build your business with a great return on investment, it can help you improve your chances of success when dealing with the funding and growth of your business. Although you may be an expert in your field, you could probably use some good advice from existing venture capitalists, angel investors, or successful entrepreneurs when it comes to obtaining financing. 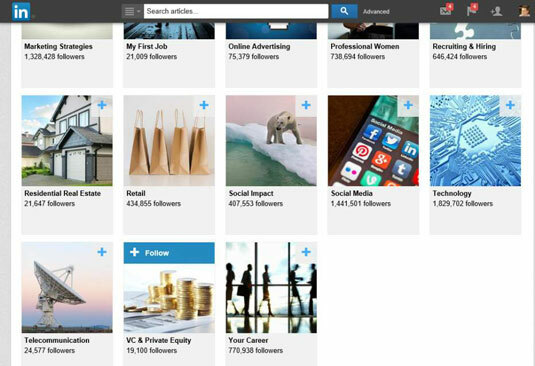 LinkedIn classifies important people in each industry as “Influencers,” and LinkedIn allows you to follow a vast array of these knowledgeable folks who are experts in their fields and who gladly give general and specific information. 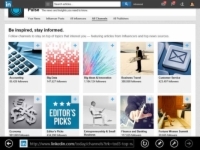 And although Pulse, LinkedIn’s news and insights aggregator, has a special channel for Entrepreneurship & Small Business, these steps focus on the channel of VC and angel funding here. If you’re not ready for that big investment, definitely check out the Entrepreneurship & Small Business channel for information. 1Hover your mouse over the Interests link from the top navigation bar, then click the Pulse link from the drop-down list that appears. You are taken to LinkedIn Pulse. 2Click the All Channels link under the Pulse header to bring up all the different channels you can follow. Scroll down the page to see the Entrepreneurship & Small Business channel. 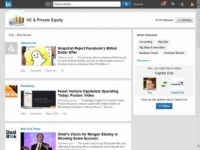 3Scroll down to the bottom of the page and locate the VC & Private Equity box. Click the + sign in the top right corner of that graphic. When you go to click the + sign, you see the Follow link appear on that box. 4After you click the + sign, you are marked as Following that channel. 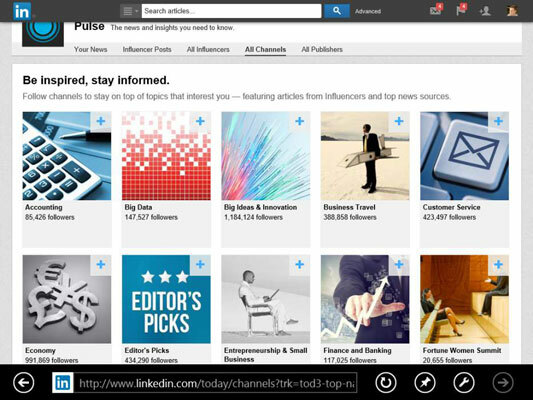 You can click the channel to see the collection of news stories and Influencer posts. Pulse channels like this one function similarly to Facebook in that members can Like, Comment, and Share the stories that are featured on the channel. You can see who in your LinkedIn network has Liked a particular story, learn more from your network by reading the Comments, and expand your influence by Sharing relevant stories with the people in your immediate network who would benefit from reading them. 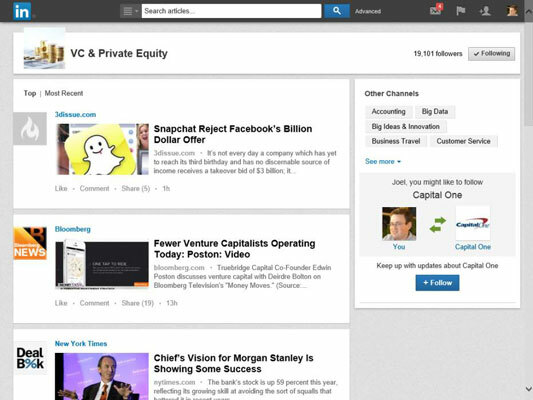 You can sort between the Top and the Most Recent stories, and as you scroll down the page, LinkedIn continues to pull relevant stories that are tagged for this channel. As of this writing, news sources such as the Financial Times, The New York Times, Bloomberg, Forbes, USA Today, and CNBC provide rich content to this channel.